At age 16, your son or daughter is probably established in an appropriate school setting, and you have worked to help develop appropriate social connections. Now is the time to think ahead to the day your young adult turns 22, when the bus no longer arrives to take him or her to school. What do you want that day and the days after that to look like? What does your young adult child need to succeed? This is the stage where you should be focusing on the future and what you want that future. Just as every child is unique, the way each parent approaches their planning is unique. Below are a few basic planning points that are unique in planning for your child from age 16 to age 21. ~ Your child's abilities may be more defined by this stage, and you may be able to have a glimpse of his or her future abilities as well. ~ Now is the time to explore options and alternatives for when your child reaches the age of 21 or 22 (the age at which your state no longer provides public education services). This is called transition planning, and focuses on residential and vocational opportunities for your child when he or she reaches adulthood. 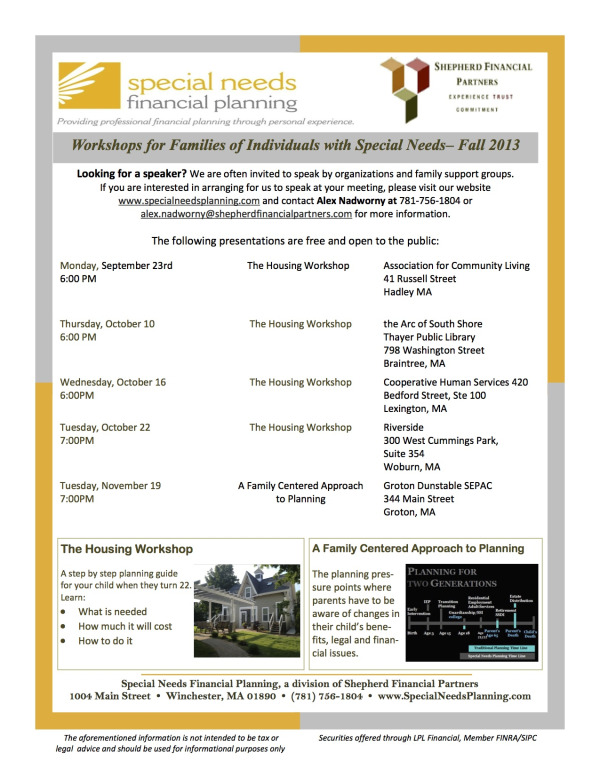 ~ Get involved in any person-centered planning programs that may be available to your family. ~ Obtain eligibility information for any and all government agencies in your state that may potentially provide funding and services for your child after turning age 22. ~ Interview and ultimately identify the most appropriate agency to provide residential and/or vocational services based on your child's abilities. Vocational services may also include a day program for your child to attend, again depending upon his or her abilities. ~ If you feel that your child will not be able to make decisions on his or her own behalf upon reaching age 18, you should consider the possibility of filing for guardianship (see our previous newsletter on guardianship and less restrictive alternatives). ~ Prepare your child to financially qualify for SSI and/or Medicaid benefits. This means that assets in his or her name, including custodial accounts, should be less than $2000 (or the current asset limits). ~ In the event that your child's assets are in excess of the limit and he or she would not financially qualify for SSI and/or Medicaid, you should contact a CFP® and an attorney knowledgeable in government benefits eligibility, to discuss options of spending down the assets or transferring them to a special needs trust (OBRA'93 Payback Trust or d4(A) Trust) prior to applying for benefits. ~ Assess your overall financial situation to help determine your ability to achieve your financial goals, including college funding for other children, financial requirements to fund the supplemental needs of your child with disabilities, and your own retirement goals. ~ Review your estate planning documents to be mindful of estate tax planning considerations, ownership and beneficiary designations of assets, retirement plans, and life insurance policies. ~ Talk to your other children about your plans and your vision for your child with special needs; they may have input to share as well. ~ Communicate with extended family members, including grandparents, aunts, uncles, and other friends and relatives, who may be interested in transferring wealth to you and your child. Tell them that you are in the process of planning for your child's future security. This is the ideal stage to begin planning for the future for your child. You still have time to make changes and to explore options if you have not done so already. This would be the ideal time to hire an independent consultant, if you have not already done so. Source: Our book! The Special Needs Planning Guide: How to Prepare for Every Stage of Your Child's Life, Brookes Publishing. 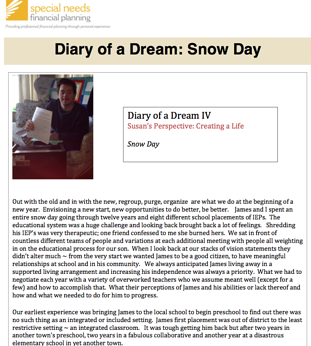 Our latest Diary of a Dream blog features Susan and James Nadworny's moving forward post-age 22, while revisiting their IEP experiences in a very cathartic way. Click on the image to the right to read the blog. Turning 22 is a new chapter and every family situation taken along with the needs and preferences of each individual, creates a unique situation to which there is no one right or wrong answer. We can help you determine financial options and strategies using both government benefit resources and personal resources to provide for your child's residential needs. We make it our business to know as many agencies and supports available to help families during this transition period. We believe that individuals with disabilities have a right to live as independent a life as possible, in the community or in their family home. In this spirit, we offer a list of resources for families-click here to access. As an additional resource, you may click here to access a partial list of residential and support service programs for young adults in transition in our (Greater Boston) area. We are here to help, please contact us for more information. When James moved from Early Intervention ( EI) services to the public school system, it felt like we had moved from a cruise ship to a dinghy. We had so appreciated the services coming to our home and the family centered approach of EI. Our opinions, schedules and plans for James mattered. When he entered the school system, our experience was very different. The IEP team immediately directed us to a segregated classroom for James. We knew that he belonged with his typical peers. We needed the teachers to support us in our vision for James. What we always tried to do with James was to surround him with people who thought he had limitless potential. If they looked at only his diagnosis, they would deny him of opportunities we thought he should have. We had to work to create a team of "believers". We continue to search out believers and people who can journey with us and imagine the possibilities. James continues to surprise us and remind us that his potential is limitless. 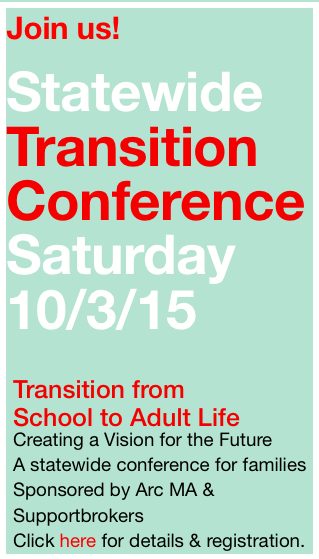 When your child reaches age 3, the family's first experience with transition will occur. You will be introduced to the educational system, and your child will need to be determined eligible to receive services through an individualized education program, or IEP. Schools will be making assessments and recommendations with important implications for your child. The parent's role is critical in working to coordinate with educators and service providers to set measurable goals and objectives for their child. Thus begins your journey of educational advocacy and understanding your roles and rights in the process, as well as the various programs, services, and supports schools may offer your child. ~ Learn as much as possible about your child's diagnosis. ~ Build and maintain relationships with physicians, schools, therapists, teachers, provider agencies, and your neighborhood community. ~ Register with your local police and fire departments, and let them know you have a child with special needs living in your home. Obtain and complete a child's identification kit, and include a current picture. ~ Get to know your state's laws on public education; make sure you have a clear understanding of your child's entitlements and your rights and responsibilities as the parent. ~ Check your local school and provider agencies for parent support groups, educational workshops, and/or parent advisory councils. ~ Make sure that your budget includes family vacations, evenings out, time away, and activities that you enjoy. ~ Review you current financial and estate plan at least every 3 to 5 years, as well as any time your situation changes.